William “Bill” F. Allyn is the grandson of William Noah Allyn, co-founder of the Skaneateles-based medical device manufacturer Welch Allyn. Despite being born with large shoes to fill, Bill emphatically met and exceeded the task. Of all his business and family accomplishments, Bill Allyn served our country for three years in the U.S. Coast Guard. Following his service, he attended Dartmouth College to earn a Bachelor’s degree in Mechanical Engineering and then an M.B.A. from Syracuse University in 1959. He married his wife and SU alumna, Penny, in 1960. Together they raised a family of four sons and 11 grandchildren. 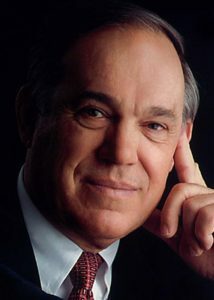 From 1980 to 1999, Bill Allyn served as the Chief Executive Officer and President of Welch Allyn, Inc., the family-owned holding company. While CEO, Bill led the company through incredible growth, transforming it into a competitive, global enterprise. He also founded Handheld Products, Inc. and Everest VIT, which manufacture remote visual inspection devices for boilers, jet engines, and nuclear reactors. The Allyn family remains an active Syracuse University supporter too, for example, through the creation of Blue Highway LLC, a health-technology incubator that offers internships to SU students. The Allyn Foundation has also helped to fund The Warehouse and the IDEAS Collaborative at Syracuse University. In 2012, Bill Allyn received the Melvin A. Eggers Distinguished Alumni Award for his loyalty and service to Syracuse University as a life trustee and visionary donor. While Bill and Penny Allyn spent the majority of their lives in Central New York, they now reside in Naples, Florida, and return home to Skaneateles during the summer. SU news highlighted that one of Bill’s fondest memories was coaching Skaneateles boys’ youth hockey for 19 years and winning three New York State championships. William F. Allyn is an alumnus of Syracuse University and a veteran of the U.S. military. You should know his story.